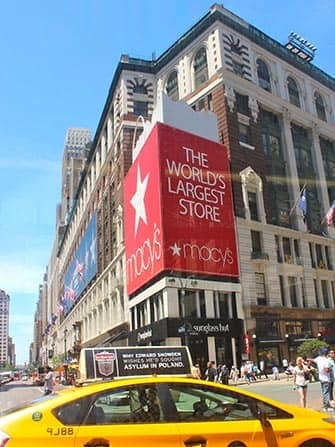 Macy’s in New York is the biggest department store in the city. It actually covers the whole block on Herald Square and has 11 floors. Macy’s is a one-stop-shop for (almost) everything you are looking for. Major brands are especially well represented at Macy’s. Exclusive discount at Macy’s! 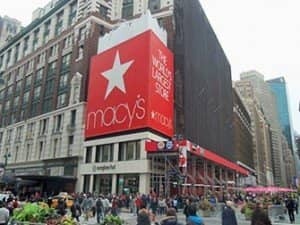 Download my Eric’s New York app and look for Macy’s on the map. Show the discount code at the counter and you’ll receive 10% discount. Shopping at Macy’s is a paradise for some and hell for others. Macy’s is so big that it might be difficult to find what you’re looking for. If only for the experience, it is nice to check it out at least once. Around the holiday season you should definitely take a look inside but avoid going on a Saturday afternoon as it will be very busy. It’s good to know that Macy’s is actually two buildings and you might have to walk through one building in order to get to the next one. Don’t hesitate to ask the staff for directions if you’re lost! Most collections are separated for men and women. For women, there are thousands of dresses so it’s smart think ahead which designers you’re interested in. Tired of walking after your visit to Macy’s? You can hop on the Hop on Hop off bus and take the Downtown loop to enjoy a couple of hours of sightseeing. As a tourist you can get a Macy’s Visitor Savings Pass. This shopping pass gives you 10% discount on parts of the collection! The pass is not valid for all items sold at Macy’s. Make-up is not included in the discount, but if you’re planning on shopping for clothes then it’s definitely worth it! You can get the pass at the Visitor’s Center at the mezzanine. The Christmas window displays attract a huge crowd during holiday season, more than 10,000 people see them during peak hours! Festive decorations continue inside as well as on the ground floor. There’s also a Santaland on the 8th floor. It’s definitely worth checking out the Macy’s Christmas decorations. They can be viewed from Thanksgiving week until 26th of December. And of course you can also shop for Christmas decorations to take home with you.